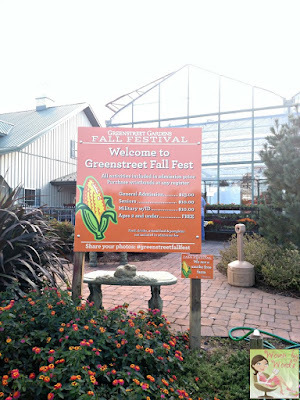 Today we finally had the opportunity to go to Greenstreet Gardens' Fall Fest. It ran through today, and I'm so glad we found the time! We've been so busy, especially on the weekends. Today as we got home from Virginia, I saw all of the cars in the parking lot and decided, it was the day! We got home, dropped off our groceries, and loaded everyone into the car. When we got there it was 3pm! Turned out it was closing in an hour. Talk about cutting it close. Not only was it closing at 4pm, it was the very last day it was going to be open. lol Clearly I had no idea! As we paid, I asked the cashier if we only had an hour left, and thankfully she said they stopped selling tickets at 4, but we could be there until 5pm! Whew! I honestly didn't even know what all Fall Fest entailed. I knew there were farm animals and a corn maze. Everything else was going to be a bonus. You walk through the area where they have face painting and hair coloring. We were in such a hurry, I missed a couple things. I think there were a couple activities for kids and some food. By the time we were ready to leave, it was all broken down so it'll stay a mystery. We boarded a hayride and we were taken to where all of the main activities were. I thought we were just going to go over a hill, and voila we'd be dropped off. HA! Silly me. It was waaaay more than that. 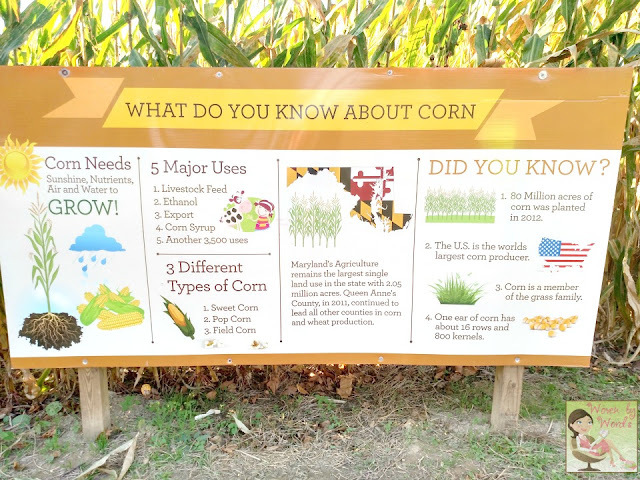 We went through an open barn that showed a little about farming. From there we went down a winding path through the woods, and thankfully it wasn't scary at all! We had really little kids on the ride, and they were just fine. 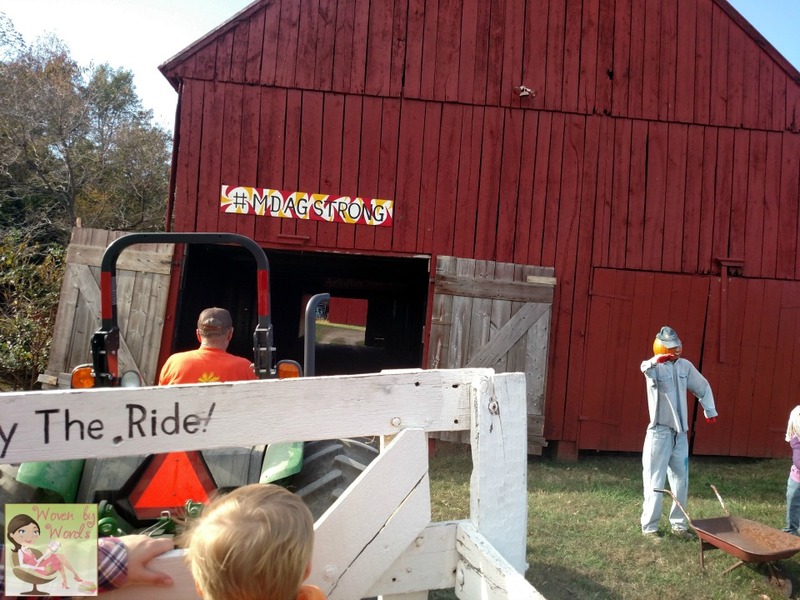 As you ride the hayride, you go by pumpkin people who are doing a variety of things. One pumpkin man is standing next to a cardboard horse in a cardboard barn. 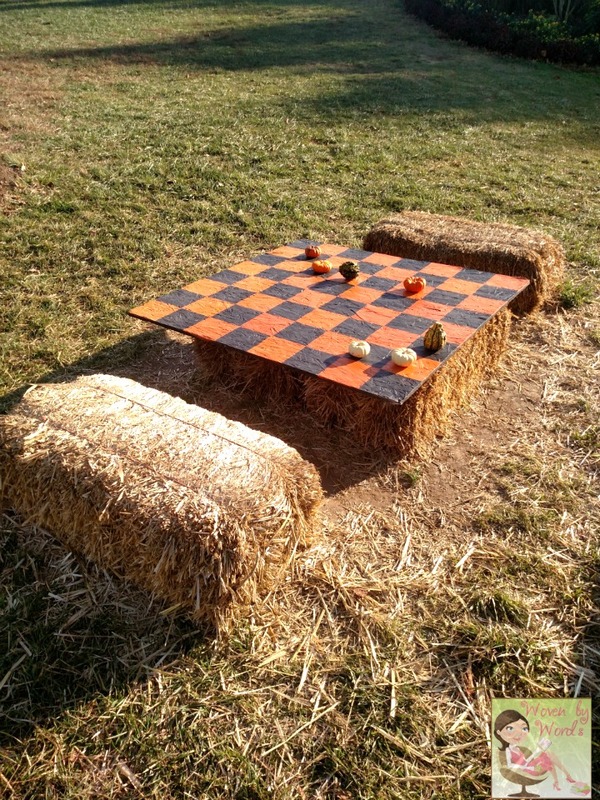 I think a pair of pumpkin people were playing checkers. 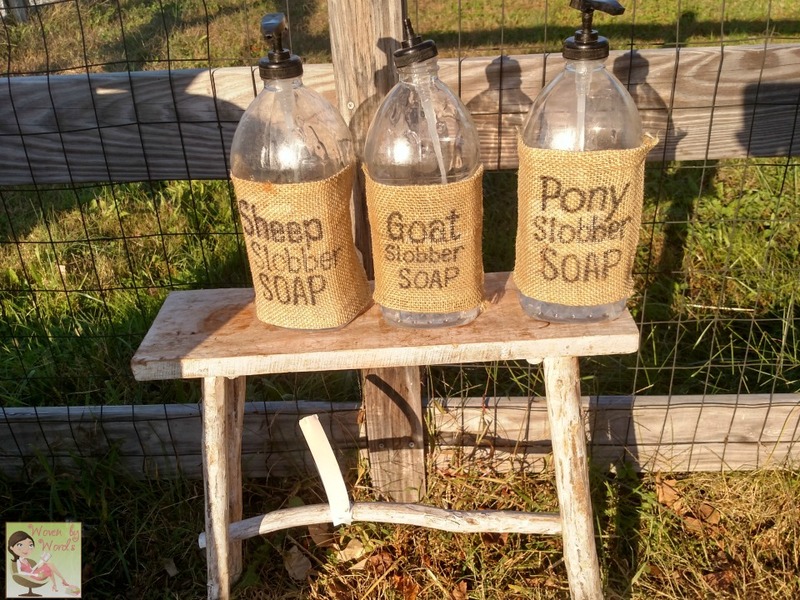 It's a cute little ride that probably takes about 5 minutes. What I liked about the ride was, it gave people a view of everything the farm had to offer for the family to do. 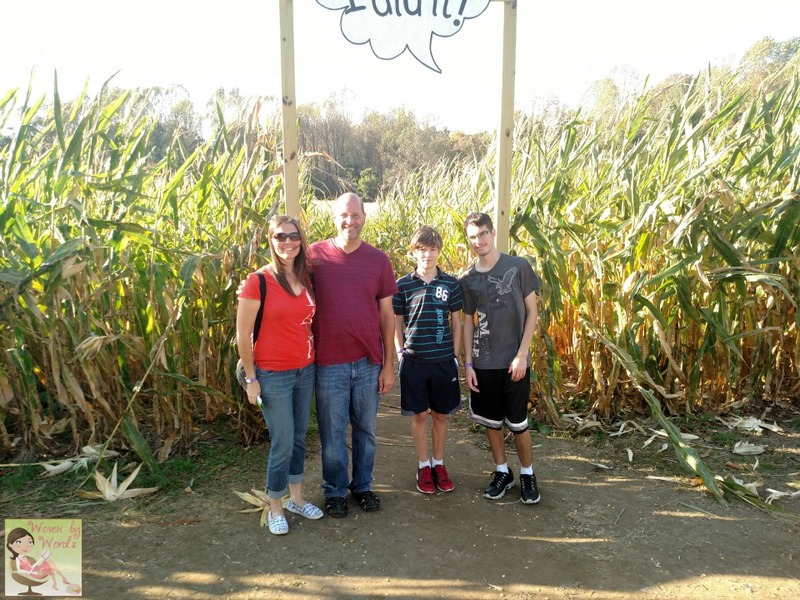 Of course the first thing we did when we got off the hay ride was to go to the entrance of the corn maze. I decided, spur of the moment, to do my first Facebook Live! What stunk was 1) my battery on my phone was nearly dead, 2) the internet connection was poor so it wasn't streaming very well, and 3) every time I tried to turn the camera around in the Live video, it took about 4 times for it to switch. lol Sakes alive. It was fun though! Thankfully I didn't stream the entire time because it took us 40 minutes to get out! 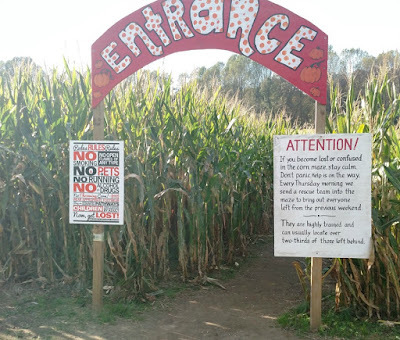 I was a little worried because Doodle ran in ahead of us and didn't want to go through the maze with us. Buddy went in second. He also didn't want to go with us. Thankfully Fred let me tag along with him. 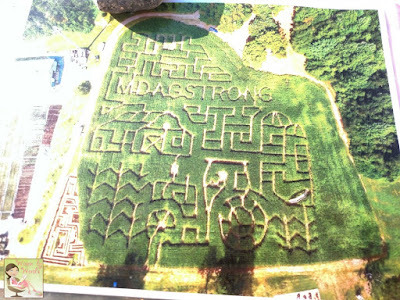 lol There's a sign at the front of the maze that says, "Attention! 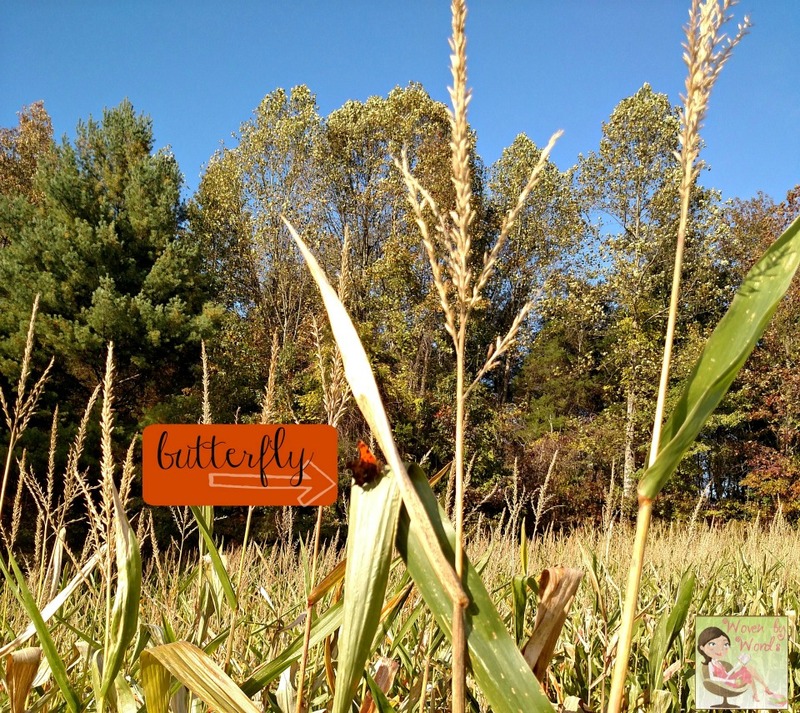 If you become lost or confused in the corn maze, stay calm. Don't panic. Help is on the way. Every Thursday morning we send a rescue team into the maze to bring out everyone left from the previous weekend. They are highly trained and can usually locate over two-thirds of those left behind." Well, that's encouraging! 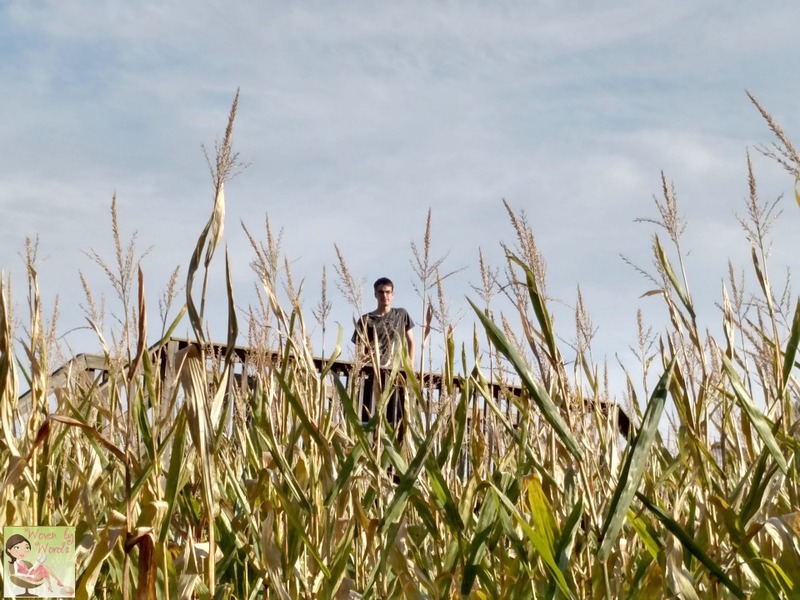 Did I mention this was my first time in a corn maze?! As we were going through the maze, Buddy called me and asked me about the exit. 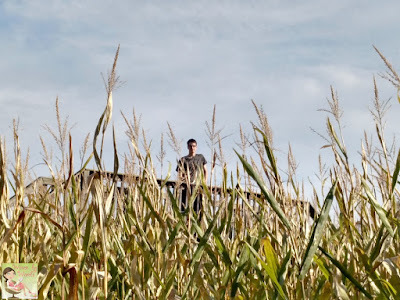 He had gone through some corn and was out on the opposite side of where the actual exit is. About 10 minutes later he popped out behind us and scared me! Punk. Not too long later, Doodle texted me to find out where we were. Apparently he'd been out for 7 minutes at that point. Show off! We walked around a little bit with Buddy, but he kept going different directions. Doodle kept texting me to see if we wanted him to come help us. I just can't believe how quickly he got out! He said it took him 24 minutes, Buddy took about 35 minutes, and the team of Fred & Mimi took 40 minutes. Now, I have to say, all I did was follow Fred. I didn't help out at all. 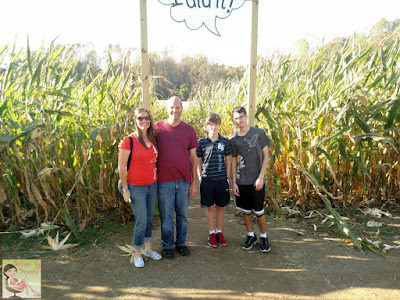 I had no sense of direction other than knowing if we were at the side, top, or bottom of the maze. I'd probably still be going in circles if I were on my own. I definitely wanted to pet some animals so we made our way to The Woodlands. That's where they have the goats, guinea hens, pallet maze, and spider web. There were 3 goats who weren't super interested in being pet. I think on the last day they'd probably had enough of people petting them and feeding them. 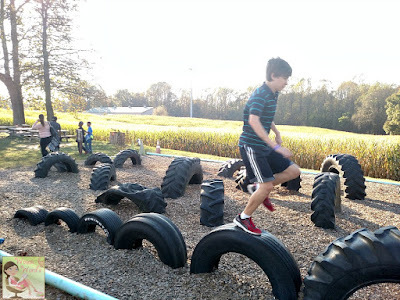 hahahaha The boys did the pallet maze in just a couple minutes. 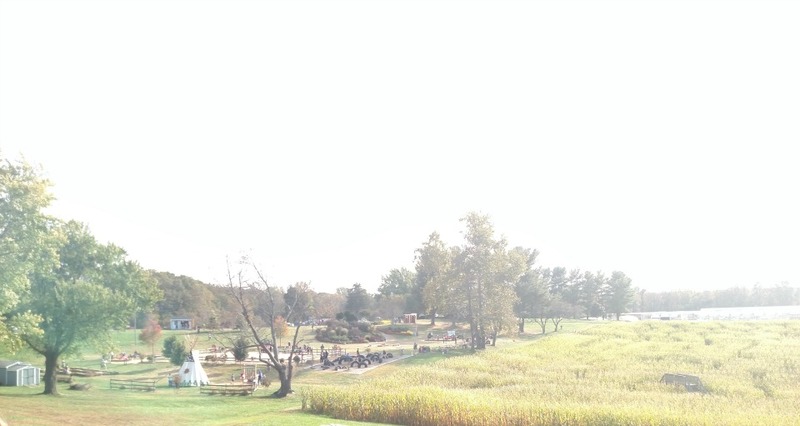 From there we headed up to meet the tractor to take the ride back to the main garden center. 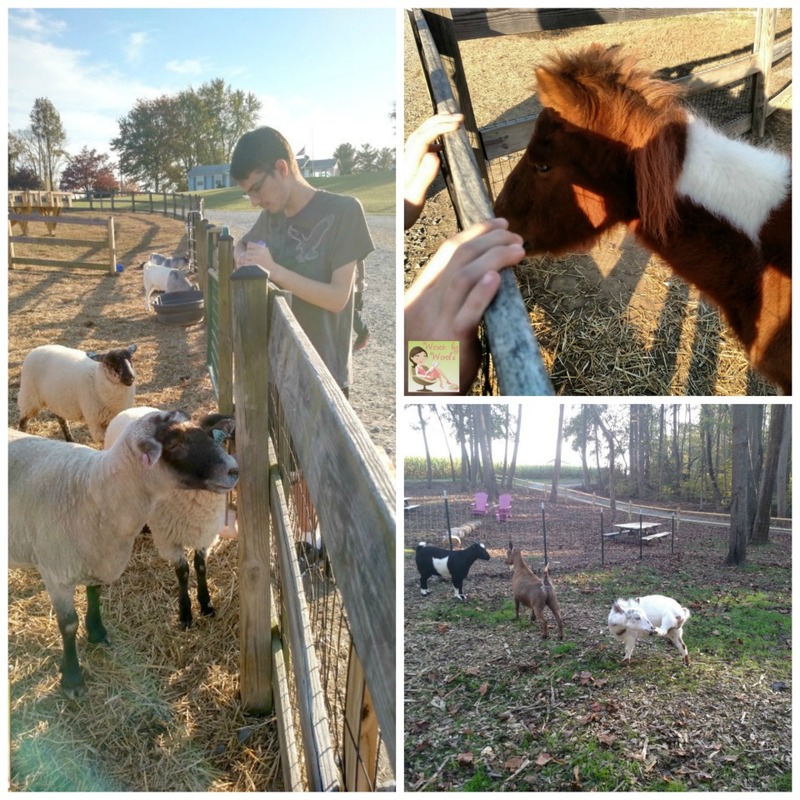 When we got back, we pet the 3 sheep and tried to take pictures with Candy the miniature horse. Everything else was shutting down because it was the last night and it was almost 5pm. We almost bought pumpkins, but with it being Halloween tomorrow, we decided to pass. If we'd have gone there 2-3 weeks ago, it would've been perfect. Next year, eh? I'm looking forward to see what they offer at Christmas. I just signed up for their Poinsettias Galore, where we can take a behind the scenes greenhouse tour. That'll be on November 19th, and I'm excited to see the beauty of poinsettias to usher in the holidays! It's so great living near the main garden.